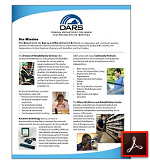 Vocational Rehabilitation Services - Information sheet highlighting the vocational rehabilitation and employer services available through DARS. 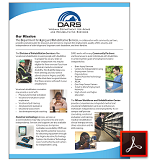 Transition Services: Get Connected - Information sheet describing the services available to students transitioning from high school to work. Advocate Services for Commonwealth Coordinate Care Plus Members – Independent advocates are available to provide information or answer questions about CCC Plus. Each year, the Adult Protective Services Division releases its state fiscal year report to inform the public of its activities. Each year the State Rehabilitation Council submits an Annual Report to the Commissioner of the federal Rehabilitation Services Administration and to the Governor of Virginia on the status of vocational rehabilitation programs operated within the state. Copies may be obtained by contacting the SRC Liaison at SRC Web. These and previous reports may also be found on the DCL unit pages, including the Office for Aging Services, the Brain Injury Services Coordination Unit and Dementia Services.